Microscopic planktonic algae of the worlds oceans are critical food for filter-feeding bivalve shellfish (oysters, mussels, scallops, clams) as well as for the larvae of commercially important crustaceans and finfish. Among the 5 000 existing marine algal species, approximately 300 can sometimes occur in such high numbers (blooming) that they obviously discolour the surface of the sea, the so-called red tides (Hallegraeff et al., 1995; Lindahl, 1998). The word bloom is used to indicate the explosive growth of any of these organisms, which may vary in colour from the commonly cited red (so called red tides) to different shades of yellow, green, brown or blue depending on the type of protista and their depth and concentration. The commonly used term red tide comes from the fact that a massive number of organisms often appear as red streaks across the surface of the water (Bower et al., 1981). The conditions for an algal bloom are not yet fully elucidated but the phenomenon is probably influenced by climatic and hydrographic circumstances (Van Egmond and Speijers, 1999). The explosive growths sometimes appear during changes in weather conditions but important contributing causes may be variations in upwellings, temperature, transparency, turbulence or salinity of the water, the concentration of dissolved nutrients, wind or surface illumination (Bower et al., 1981). There are no reasons to assume that shellfish intoxication can be predicted by the properties of the regional area. In general, red tides often occur when heating or freshwater runoff creates a stratified surface layer above colder, nutrient-rich waters. Fast-growing algae quickly strip away nutrients in the upper layer, leaving nitrogen and phosphorus only below the interface of the layers, called the pycnocline. Non-motile algae cannot easily get to this layer whereas motile algae, such as the dinoflagellates, can thrive. Many swim at speeds in excess of 10 metres a day, and some undergo daily vertical migration; they reside in surface water like sunbathers and then swim down to the pycnocline to take up nutrients at night. As a result, blooms can suddenly appear in surface waters that are devoid of nutrients and seem incapable of supporting such prolific growth (Anderson, 1994). Evidence is increasing from diverse areas (such as the Hong Kong Harbour, the Seto Inland Sea in Japan and North European coastal waters) that cultural eutrophication from domestic, industrial and agricultural wastes can stimulate harmful algal blooms. It is even possible that algal species which are normally not toxic may be rendered toxic when exposed to atypical nutrient regimes (e.g. 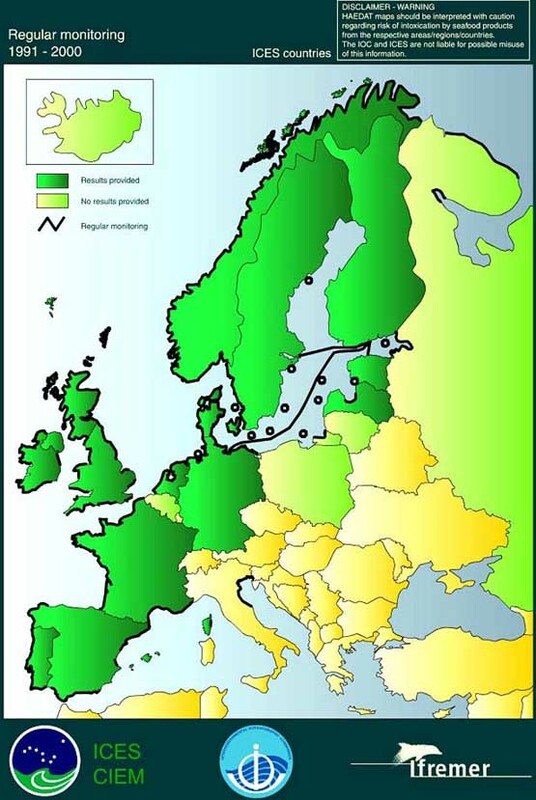 phosphate deficiencies) resulting from cultural eutrophication. Changed patterns of land use, such as deforestation, can also cause shifts in phytoplankton species composition by increasing the concentrations of humic substances in land runoff. Acid precipitation can further increase the mobility of humic substances and trace metals in soils (Hallegraeff, 1993). Some species produce basically harmless water discolorations. On the other hand, some species can bloom so densely, under exceptional conditions in sheltered bays, that they indiscriminately kill fish and invertebrates due to oxygen depletion. Other algal species can be harmful to fish and invertebrates (especially in intensive aquaculture systems) by damaging or clogging their gills. Furthermore, there are micro-algal species (about 75) which have the capacity to produce potent toxins (called phycotoxins) that can find their way through levels of the food chain (e.g. molluscs, crustaceans and finfish) and are ultimately consumed by humans causing a variety of gastrointestinal and neurological illnesses. Some algal species already produce toxins at low abundances of some hundreds of cells per litre, while other algal species must occur in some millions of cells per litre in order to cause any harm. Most of the harmful species have a restricted distribution pattern but some harmful species have a worldwide distribution (Hallegraeff et al., 1995; Lindahl, 1998). It is not clear why some micro-algal species produce toxins. These toxins are secondary metabolites with no explicit role in the internal economy of the organisms that produce them and with very specific activities in mammals. They are probably used by their producers as a way to compete for space, fight predation or as a defence against the overgrowth of other organisms (Botana et al., 1996). During the past two decades, the frequency, intensity and geographic distribution of harmful algal blooms has increased, along with the number of toxic compounds found in the marine food chain. Different explanations for this trend have been given such as increased scientific awareness of toxic algal species, increased utilization of coastal waters for aquaculture, transfer of shellfish stocks from one area to another, cultural eutrophication from domestic, industrial and agricultural wastes, increased mobility of humic substances and trace metals from soil due to deforestation and/or by acid precipitation (acid rain), and unusual climatic conditions (Hallegraeff et al., 1995). In addition, monitoring for toxic algae and/or (shell)fish is now carried out in several coastal areas of the world. 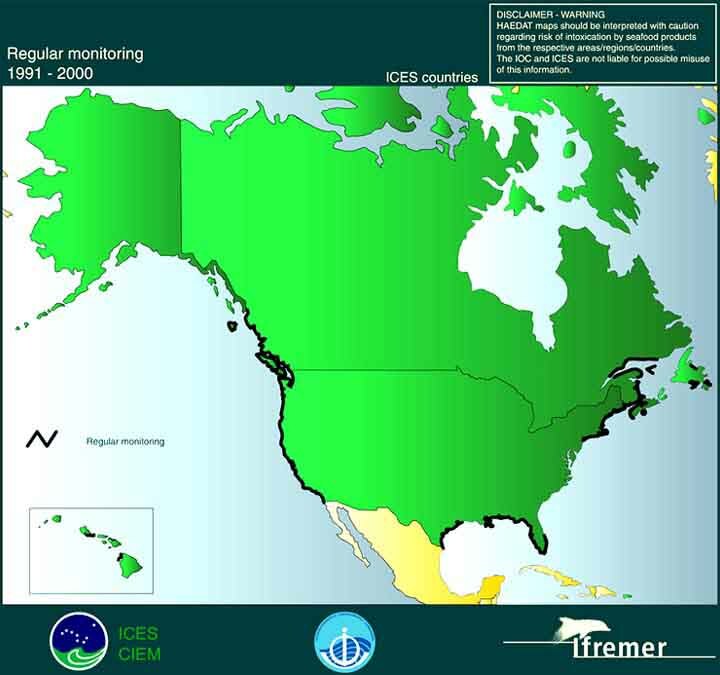 Figures 1.1 and 1.2 illustrate monitoring in coastal waters of European and North American countries in the International Council for the Exploration of the Sea (ICES). The transportation of dinoflagellate resting cysts, especially from paralytic shellfish poisoning toxin producers (McMinn et al., 1997), either in a ships ballast water or through the movement of shellfish stocks from one area to another provides another possible explanation for the increasing trend of harmful algal blooms (Hallegraeff et al., 1995). The resting cyst or hypnozygote is the immobile form of some dinoflagellates. These cysts sink to the bottom of the sea and accumulate at the borderline of water and sediment where they over-winter. When favourable growth conditions return, the cysts may germinate and reinoculate the water with swimming cells that can subsequently bloom. In this way the survival of certain dinoflagellates from one season to the other season is assured (Mons et al., 1998). v. azaspiracid shellfish toxins causing azaspiracid shellfish poisoning (AZP) (Hallegraeff et al., 1995; Lindahl, 1998). Ciguatoxins cause ciguatera fish poisoning (CFP). PSP, DSP, ASP, NSP and AZP are caused by human consumption of contaminated shellfish products whereas CFP is caused by the consumption of subtropical and tropical marine carnivorous fish that have accumulated ciguatera toxins through the marine food chain. Various aspects of these toxins will be reviewed in this publication.